One of the aims of the DiN label was to act as a community of artists who could interact and colloborate in different ways. DiN 18 is a perfect example of this with label founder Ian Boddy forming a new creative partnership with Bernhard Wöstheinrich. DiN afficionadas will recognise the latters previous involvement as both one half of Centrozoon on DiN 6 - Blast and also Subsonic Experience on DiN 13 - Praposition. Furthermore Wöstheinrich, a trained graphic designer, has also been instrumental in the sense of design style that permeates the DiN artwork since DiN 10. However the collaborative mesh involved in the creation of Moiré has further layers in that Markus Reuter, long time Boddy colloborator & musical partner to Wöstheinrich in Centrozoon was also heavily involved in the early editing of the pieces as well as guesting on bass on the track "Fractalise". Indeed the gestation of Moiré has been a long and complex process. 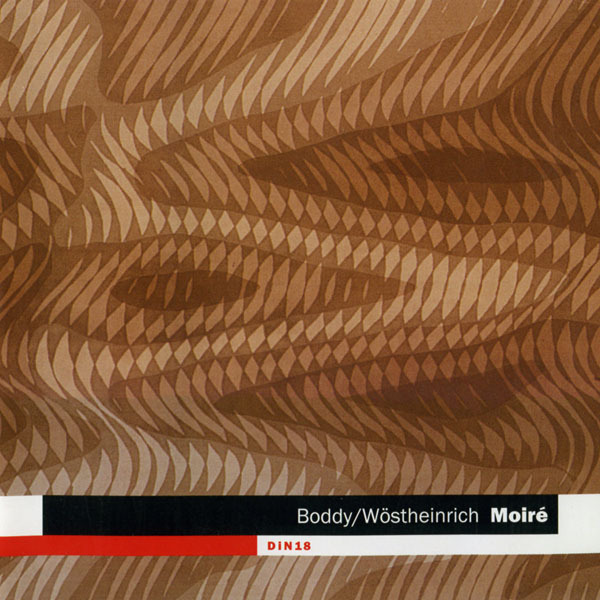 Boddy & Wöstheinrich first got together in the DiN studio way back in April 2002 and played a number of improvisations utilising Boddys mastery of his large analogue modular system with Wöstheinrichs quirky & organic approach to drum & arpeggiator patterns. These sessions were then locked in the DiN vault for almost a year until Reuter opened the lid and intuitively edited the performances into a number of arrangements that formed the basis of the tracks on Moiré. The baton was then taken on by Wöstheinrich who, over the summer of 2004, further added to and sculpted the pieces into more refined forms. 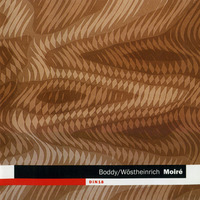 The final lap was then for Boddy & Wöstheinrich to finalise the arrangements & mix at the DiN studios in December 2004. The resulting music spread over 10 tracks captures both the detail & complexity of arrangement possible with modern music technology with the spontaneous nature & organic feel of the original improvisations. Sonically it effortlessly ranges from classic analogue sequencer lines to deep, metallic atmospheres through to full on drum & synth work-outs. The majority of the tracks employ organic analogue arpeggiations together with muscular & unusual percussive loops to form the backbone of the music . Ethereal ambient textures provide a suitably surreal counter-balance to the solidity of the rhythmic structure to create a constant sense of flow & change within the compositions . Ian Boddy : Analogue modular synth, sequencing. Bernhard Wöstheinrich : Keyboards, sequencing & drum machines. Markus Reuter : Scratch bass on "Fractalise". SiRenée : Voice on "Scorpio" and "Moiré".